Free The Tone Flight Time FT-1Y Review – Best Digital Delay Pedal? The Free The Tone Flight Time FT-1Y is a very unique design in the world of digital delay pedals. Forgoing knobs for tiny buttons and 5 digital display screens make it look more like the interior of the Delorean from Back To The Future than a typical guitar pedal. But the Flight Time’s unique interface was designed to give guitarists unprecedented, yet simple control over a studio-grade, 32-bit high-precision DSP delay powerhouse for your pedalboard. For the creation of this pedal Yuki Hayashi of Free The Tone received much feedback from the many professional musicians who rely on Free The Tone’s guitar pedals and pedalboard/rack effects switching systems (which include the ARC-3 and ARC-53M). Of particular consideration was creating a new, simple to use delay pedal interface while maintaining the highest possible delay sound quality. Particular attention was paid to the digital display layout and the selection of editable parameters. There are some obvious similarities in appearance to the TC Electronic 2290, the famous rack delay from the 80’s, but with a serious modern upgrade in terms of processing power and – hopefully – sound quality. The Flight Time is also loaded with 99 presets, tap tempo, MIDI, and 2 “world-first” features: Realtime BPM Analyzer and Delay Time Offset. It has the makings of what could be the new best digital delay pedal available. 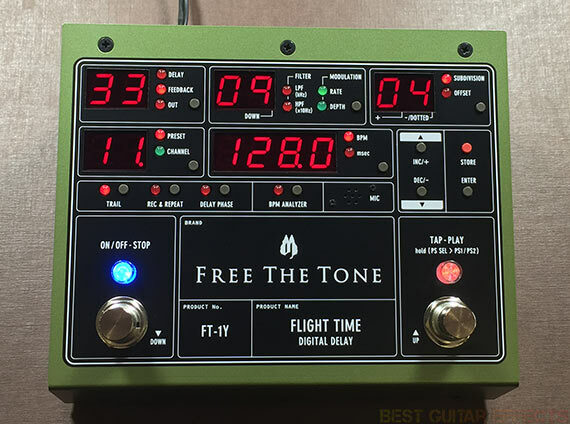 Here’s a rundown of the features before we find out it lives up to the hype in our Free The Tone Flight Time FT-1Y review. Implemented HTS (Holistic Tonal Solution) circuit and analog mixer. HPF (high-pass filter) and LPF (low-pass filter). Modulation (controls for Rate & Depth). Subdivision function (whole note, half note, dotted quarter note, triplet in four, quarter note, dotted eighth note, triplet in two, eighth note, triplet in one, and sixteenth note). High-speed calculation by a 32-bit high-precision DSP. 99 presets (user: 90, factory 9). Powered by included 12VDC power adapter. 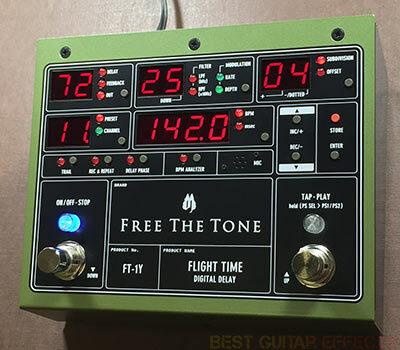 Visit Free The Tone for more info about the Flight Time FT-1Y. The Flight Time has a retro yet futuristic vibe going on aesthetically, and this is carried over in its sounds and functionality as well. This pedal has a pristine audio quality that isn’t sterile like some digital delays, just perfectly accurate in how it replicates the sound of your guitar. The Flight Time is a precision instrument designed to do one thing exceptionally well: delay your guitar sound. On that front it succeeds greatly. This pedal doesn’t follow the trend of packing in tons of delay algorithms, but the control you have over the Flight Time’s single digital delay line is very commendable. This pedal also has a few surprising tricks up its figurative sleeve as you’ll soon learn. Especially important to shaping Flight Time’s delay sound are its High-Pass and Low-Pass Filters which give you surgical precision in sculpting the tone of your delay effects. While analog delays are typically characterized by their reduced upper frequencies, it’s rare to have this much control over dialing in just the right amount of high-end rolloff to get that perfect analog-like sound. While there isn’t a continuous reduction of high-frequency rolloff on each repeat or continuous degradation of fidelity, the added warmth provided by the LPF does go a long way towards created a delay sound that is much more lively than your typical digital delay pedal. The HPF also lets you cut out the low-end frequencies of the delays, helping you maintain the focus of your bottom end and creating delay trails that float over your playing. At extreme settings this HPF can create a metallic sounding magnetic drum tape echo vibe. The modulation is useful for adding movement to your delays, further entering the realm of 2290-style modulation and tape echo simulation although it’s really difficult to say the Flight Time is like either as it has its own unique sound. Modulation controls for Depth and Rate let you dial in the degree of pitch-shift and the speed of the modulation. The modulation isn’t synced to the tempo, so whether you speed up the delay time or slow it down (manually with control buttons or via tap tempo), the modulation remains consistent. Considering its lack of knobs, in some ways the Flight Time doesn’t lend itself especially well to quick on-the-fly adjustments, at least not quite as easily as just grabbing a knob and twisting. This means that you’ll probably want to find and save your delay settings in rehearsal and recall them as presets during a performance, not tinker around with the pedal on stage. Pro guitarists who’ve used rack delays will be familiar with this. While the Flight Time’s presets can be recalled via the pedal’s 2 foot-switches, for most efficient performance I’d recommend a pedal switcher like Free The Tone’s own ARC-53M or any pedal switcher that has MIDI capabilities. While the delay (and chorus) sounds this pedal produces are so good that every guitarist who hears them will probably want a Flight Time, this pedal is especially suited to professional guitar players who require the utmost in “elite” grade hardware performance and integration in their most likely MIDI-controlled rig. If any guitar techs are reading this, know that this pedal is up to par with the best high-end digital delays around and was built with pro rigs in mind. And any guitarist still building their rig up to that level will be in for a serious upgrade by adding the Flight Time to their setup. Having optional delay trails per preset is great. This feature has its own dedicated button, so you don’t have to go into a menu to turn trails on and off. Selecting your MIDI channel is easy with it’s own button (shared with Preset selection), again emphasizing this pedal’s desire to be added to a MIDI guitar rig. The Delay Phase button is brilliant and will ensure your delay and chorus sounds pop through the mix instead of canceling itself out against your dry signal. Some guitarists may look at this pedal and say, “Wait, no stereo?” There is a dedicated Dry On/Off switch. This removes your dry signal from the pedal’s audio chain, letting only the wet signal pass through the pedal. You could put the Flight Time in either the left or right side of a stereo signal chain and leave it on for stereo delay and chorus effects, selecting a 1ms preset from an effects switcher for “dry” sounds on that side for “bypassed” sounds. I wouldn’t call this an ideal solution. But then again, most gigging guitarists aren’t actually dragging around 2 amps to their gigs. While guitarists who buy for specs love having a delay with stereo ins and outs, let’s face it, most guitarists really don’t need them. I was also able to create some amazing vibrato sounds by turning the Dry switch to Off and using the modulation with the HPF and LPF. The only problem is that bypassing the pedal kills the signal making the vibrato only usable (assuming you don’t want it on all the time) if you put the Flight Time in an effects switcher loop. But this isn’t the most efficient way to use the pedal since it can usually be bypassed via MIDI, sparing you from wasting a loop on your effects switcher. I’d prefer to see a software update that allows the Output parameter to reduce the dry signal volume all the way down to zero without affecting the volume of the wet delay signal, leaving the Delay parameter to set the delay level independently. This would enable independent Wet/Dry level control, allowing vibrato presets and making it easier to create delay presets with a lower volume dry signal and boosted wet signal if you’re into that. Having separate level controls would add more flexibility for sequencing the Flight Time with MIDI for programmed delay effects. I’ve experimented with sequencing the Flight Time’s Hold function with jaw-dropping results similar to the Beat Repeat effect in Ableton Live, only somewhat limited in that I can’t program independent wet and dry volume automation. There’s a fully programmable glitch delay monster waiting to be unleashed if Free The Tone were to implement this minor adjustment. 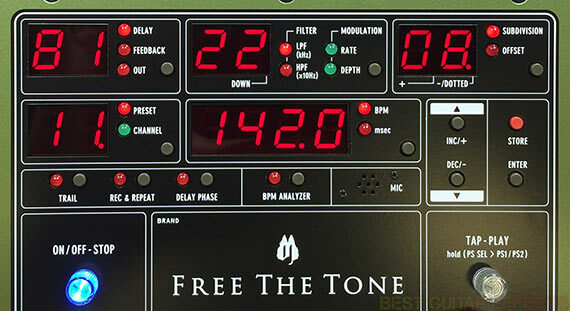 The BPM Analyzer allows a top-mounted mic to detect music being played and adjust the tempo by +/- 20% to compensate for fluctuations in tempo. You know that drummer who keeps speeding up or slowing down a little during a song? This might be your solution if your drummer refuses to use a click. I was unable to test the BPM Analyzer with a band but did manage to test it out in some context. I loaded up various songs in Ableton Live and tapped in a tempo on the Flight Time. Then I adjusted the BPM in the software to speed up and slow down the music. After a few seconds the tempo display on the pedal would change to match the new tempo the song was playing at. It’s really neat to watch the pedal keep up with old songs that weren’t recorded to a click track. Very cool! Of course, I had great results syncing music with straight ahead rock drum beats and 4/4 electronic music. Songs with complex time signatures are hit or miss. As you can probably imagine there will be many factors affecting how well this feature works, most notably the proximity of the Flight Time’s microphone to the meter keeping musical element (your drummer!). Since it stays within reason of your tapped tempo, you shouldn’t have to worry about it jumping to some crazy tempo mid-song. This feature actually seems potentially more useful than I gave it credit for at first. Try it in a band context during spontaneous jam sessions when you’re not already playing to a click track. The Delay Time Offset is particularly useful for having your delays come in a little early, ahead of the beat. This adds a sense of energy to your playing and contributes to a more organic delay feel. The difference is subtle (although you can dial it in to be more extreme or even behind the beat) but contributes to giving the Flight Time a unique playability that more experienced guitarists will notice and appreciate. The Hold function has it’s own dedicated foot-switch input. It’s not quite up to par with a fully featured looper, but it is a novel way to repeat a phrase and play over it. As I mentioned before, there are some very interesting possibilities to be had from sequencing this option with MIDI (and also automating Subdivision changes). Some guitarists may have preferred some form of expression pedal control in terms of additional plugin possibilities, but this feature can be worth exploring for layering textures or adding moments of repeated passages or harmonize with or jam over. The Flight Time really won me over the more I played it. I’ll admit that I was apprehensive about a knob-less pedal, but I did find the buttons on Free The Tone’s ARC-53M very useful. Likewise, I’ve found myself really appreciating this pedal’s depth and it’s menu-less interface. I was surprised to learn that considering its MIDI implementation and the fact that you can control every parameter via MIDI that there is no support for MIDI clock. This means you should save your tempo with presets and/or use tap tempo, perhaps with the BPM Analyzer. Most guitarists won’t mind. A few of us MIDI nerds might be annoyed. It would be a dream come true for me if Free The Tone added the ability to receive MIDI clock on a per preset basis as that’s one of my most desired features in a MIDI compatible delay pedal. The one update I’d most like to see is what I mentioned before about making the Output be a Dry level control (down to zero) with the Delay controlling the Wet delay level. This would allow the excellent vibrato sounds to shine and be savable as presets while adding essential MIDI programming flexibility. While it would be fantastic if Free The Tone released a modulation pedal, it would be interesting if there was a way to implement tap tempo for the modulation rate for tempo-synced chorus and vibrato sounds. That would also expand the sound palette and help some guitarists justify purchasing this excellent delay pedal for its equally great chorus/vibrato effects. 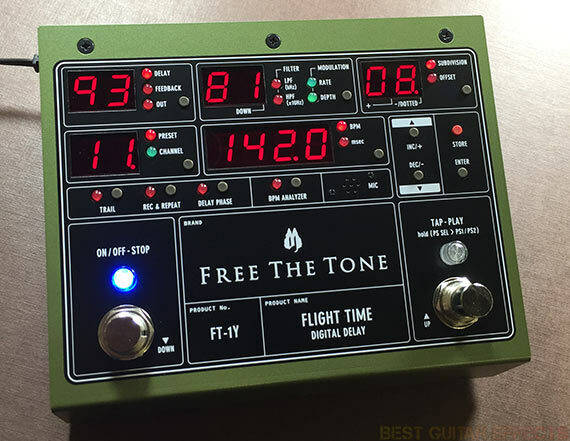 The Flight Time is a new foray for Free The Tone (compared to their all-analog Red Jasper Overdrive, Silky Comp Compressor, & Gigs Boson Overdrive pedals) and is an innovative delay pedal that deserves attention. Let’s see the final result. The Free The Tone Flight Time FT-1Y is a stellar digital delay pedal. The sounds it produces are immaculate, and the option to filter the delays makes it easy to achieve an ideal delay tone to fit in your mix. The modulation sounds are so good that it also makes the Flight Time worth considering for its pristine (and lo-fi!) digital chorus effects. The lack of knobs may put off some guitarists, but those who can appreciate the Flight Time’s retro aesthetic will be in delay heaven. While the ideal place for this pedal is in a MIDI-controlled rig, it really sounds so good that it deserves serious consideration for non-MIDI pedalboards as well. The Delay Time Offset and Realtime BPM Analyzer are signs that Free The Tone are thinking outside the (stomp)box. The Flight Time is definitely up there with the best digital delay pedals available, and it’s only a few minor software updates away from most likely becoming my favorite delay pedal. That concludes our Free The Tone Flight Time review. Thanks for reading. Want to buy the Free The Tone Flight Time FT-1Y? Superb pedal. Like Realtime BPM!